The Canadian province of Quebec produces almost three-quarters of the world’s maple syrup on production farms called sugarbushes. 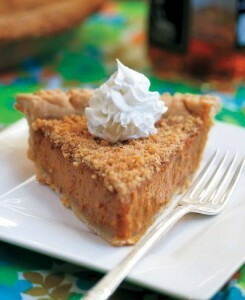 It is enjoyed over pancakes or waffles and used extensively in baking, such as in pumpkin pie, a favorite in Canada. This pie encapsulates both maple syrup’s unique flavor and distinct sweetness that complements the pumpkin beautifully. Combine all the ingredients for the crust in a food processor for about 2 minutes or just until crumbly, scraping down the sides as necessary. Remove and press into the bottom of an ungreased pie pan. (Use the bottom of a drinking glass to press the crust into the pan) Poke holes in the crust with a fork and bake for 10 minutes. Remove from the oven. Increase the oven temperature to 425° F.
Puree all the “filling” ingredients in a food processor or blender until very smooth. Spread evenly into the prebaked crust. Bake the pie for 13 minutes; reduce the heat to 350° F and bake for 45 to 50 minutes more. Let cool completely, top with crushed walnuts, and then transfer to the refrigerator. Chill overnight before cutting.